War has not always been around, humans invented war. Most of the time in human history we did not wage wars. It’s not in our genes. We have to be trained to be able to kill. War does not break out. We chose when and how to participate. 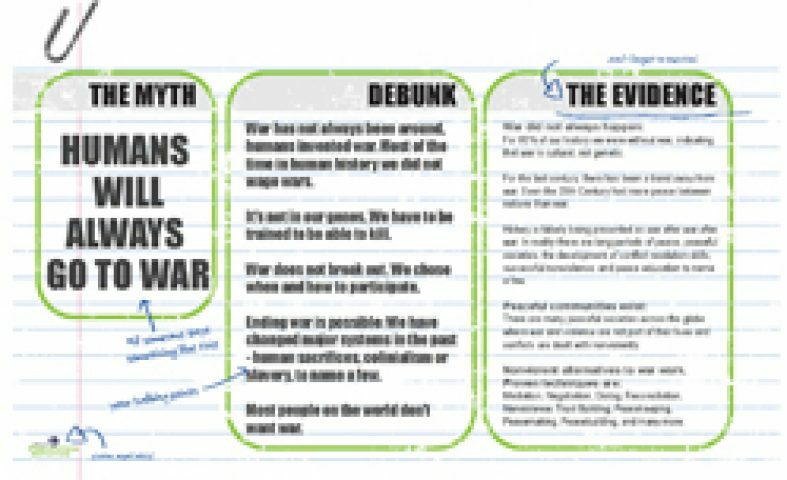 Ending war is possible: We have changed major systems in the past – human sacrifices, colonialism or slavery, to name a few. Most people on the world don’t want war. 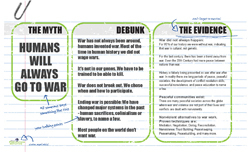 For 95% of our history we were without war, indicating that war is cultural, not genetic. For the last century, there has been a trend away from war. Even the 20th Century had more peace between nations than war. History is falsely being presented as war after war after war. In reality there are long periods of peace, peaceful societies, the development of conflict resolution skills, successful nonviolence, and peace education to name a few. There are many peaceful societies across the globe where war and violence are not part of their lives and conflicts are dealt with nonviolently. Mediation, Negotiation, Dialog, Reconciliation, Nonviolence, Trust Building, Peacekeeping, Peacemaking, Peacebuilding, and many more. Fry, Douglas P. 2012. “Life without War.” Science 336: 879–84. Fry, Douglas P. 2006. The Human Potential for Peace: An Anthropological Challenge to Assumptions about War and Violence. New York: Oxford University Press. Fry, Douglas P. 2013. War, Peace, and Human Nature : The Convergence of Evolutionary and Cultural Views. New York: Oxford University Press. Horgan, John. 2013. The End of War. McSweeney’s. Shifferd, Kent D. 2011. From War to Peace : A Guide to the next Hundred Years. Jefferson, N.C.: McFarland.